I’m absolutely nuts about “everything” bagels, but I don’t eat them often – mainly because I’m choosy about my bagels, and I don’t usually go out to buy the good ones. I save them for a special breakfast treat just a few times a year. However, when that “everything” desire hits me, I want to satisfy it as quickly as possible, so this chicken recipe is a fantastic way to satisfy my tastebuds while saving me from myself. Mix the sesame seeds, poppy seeds, caraway seeds, garlic powder, and coarse salt in a shallow dish. Dredge the chicken strips in the spice mixture. Heat 1 tablespoon of olive oil and 1 tablespoon of butter in a large skillet over medium to medium-high heat. When the butter is melted, add half of the chicken strips to the skillet, making sure not to overcrowd the pan. Cook, flipping once, until golden brown on both sides and firm to the touch, about 4 minutes per side. Repeat with the remaining chicken, olive oil, and butter. 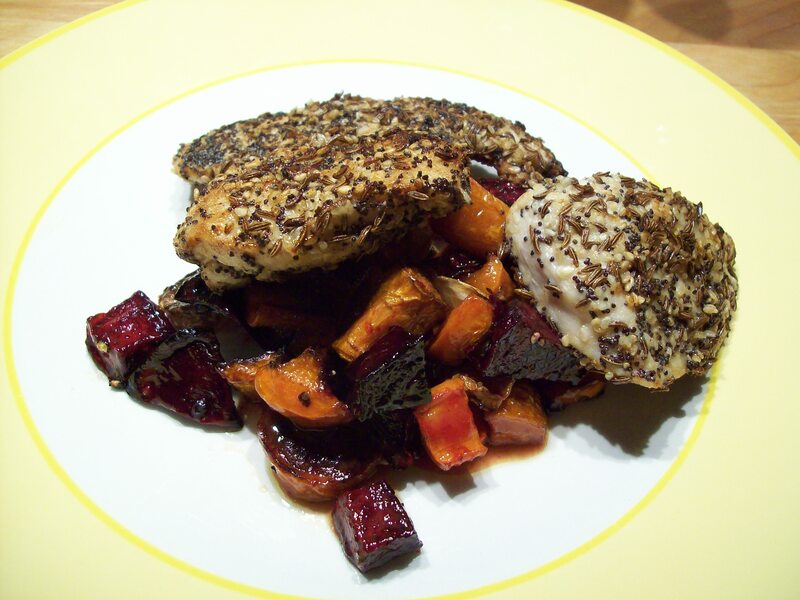 We enjoy this chicken served on a bed of roasted root vegetables (beets, turnips, and carrots or sweet potatoes) tossed with a favorite vinaigrette, but it’s equally good on top of any salad or served with crispy potatoes and your favorite vegetable.